Elsie Johnstone is traveling in India with Enchanting Travels, and this time she writes about discovering both Delhi’s most famous landmarks as well as snatches of everyday life that make it one of the world’s most incredible cities. 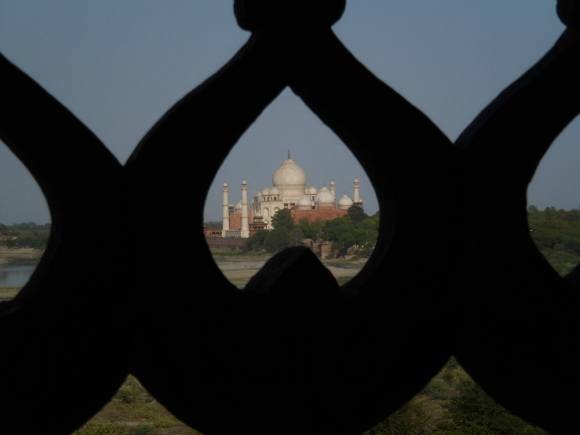 She then journeys on to Agra, home of the epic Taj Mahal and symbol of an immensely moving love. It is hot (about 40 degree C) but it is a dry heat, so is bearable. The highlight of the day for us was definitely the visit to Mahatma Gandhi’s Museum. Fantastic. What a man: so wise and true to himself. He began as a barrister and became an activist when asked to leave an all-white train carriage in South Africa. Bad decision on the part of the white euphemists. Loved the photo of him at Buckingham Palace in his loin cloth. Imagine the “ohs” and “ahs”! Such simplicity amidst such palaver. The exhibition was housed in the building that Gandhi spent his final days and retraces his path to prayer on the night he was assassinated. We read every word panel with lumps in our throats. I usually scrimp on the information at museums but this was compelling and amazingly emotional because his words were so pure and wise. From there we visited Lodi Gardens: a beautiful spot in the middle of the hustle where young lovers go to whisper sweet nothings away from prying eyes. Couldn’t find a park bench that wasn’t occupied by either lovers or resting gardeners having their siesta. Ate our final dinner in the rooftop garden and fixed up the bill – $70 for three nights with beers. Who would have thought that we would be sitting on a rooftop in Delhi on a balmy night sipping a beer and eating a home-cooked curry? We can hear the faint cheers of a cricket match that is being played in a stadium nearby. We sadly bid farewell to the Colonel’s establishment after having an early breakfast amongst the rooftops with the birds, served with a smile by the houseboys. The Colonel’s was a great place to start our India tour: comfy, simple and clean rooms in the Portuguese style and serving delicious home-cooked Indian food. We ate there each night and enjoyed every morsel. The road trip was fascinating, something to look at all the way. We felt as if we had been transported through time and place to a world that is fast disappearing. The road itself was being transgressed by all manner of carts. Tractor-trailers filled with families, animals and produce on the way to market. Men and women walked along the motorway carrying the packages and produce on their heads, cars and tuk tuks loaded to the brim with people; the only thing we didn’t see was an elephant. On either side of the road to Agra, farmers were busy with harvesting, cutting the crops, allowing the livestock to feed on the stubble and then burning the dry stalks before they plough the ground (using a water buffalo)and all the while awaiting the monsoon rains so they can plant their rice. In the corner of each paddock there was a tree for shade and a round grass hut where they eat lunch and sleep during the hottest part of the day. I find something very appealing about this way of life. 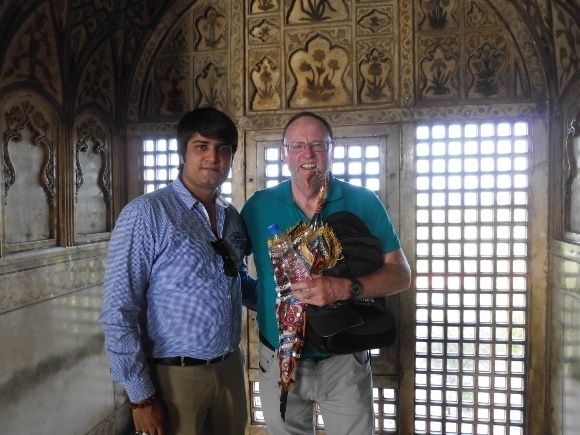 After a quick siesta at our luxury hotel, ‘The Gateway,’ our guide arrived to show us around Agra. His name was also Anil and he was a keen photographer and took some lovely shots of the Taj Mahal from the Red Fort. They are excellent. The one below the next paragraph is Anil’s! Our generation thinks we are clever, but the summer palace we visited had hollow walls so that they could run water down the inside to cool the place down. They also created magnificent wind tunnels and on the 110 degree C day it was certainly welcome. We watched the sun set on the Taj Mahal at exactly 6.55 pm. To be honest with you I could not see any difference in color at all. That doesn’t detract from the fact that it is a beautiful, magnificent monument. And it is such a poignant love story! It was built for the third wife, his one true love and once she came to him they did not spend a single day apart until she died in childbirth having her fourteenth child. The king blamed the child and never forgave her. He would not have her living with him. Dinner at the hotel was a fabulous feast of all the local curries and accompaniments. I love the Indian food of this region, it is not chilly hot but it is spicy. Discover traveling in India for yourself.